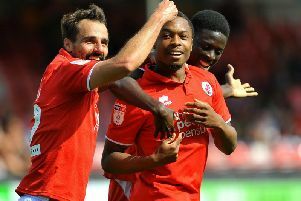 Crawley Town went within one point of the play-offs as second half goals by Luke Gambin and Ollie Palmer secured Reds’ fourth successive home win. After weathering a good attacking display by the visitors in the first half, Reds took the lead with 19 minutes to go through Gambin. Palmer made it 2-0 six minutes later with his seventh goal of the season. Crawley made four changes to the side which lost at Notts County with Mark Connolly, Joe Maguire, Mark Randall and Bondz N’Gala all back in the team. Romain Vincelot and Panutche Camara were dropped to the bench while Joe McNerney and Josh Doherty were out of the squad. Cambridge made the early running with Liam O’Neil finding the ball in the net after 11 minutes with a goal which was disallowed for offside. Reds ‘keeper Glenn Morris produced a magnificent save at full stretch to tip over the bar a shot by George Maris. Morris made his second save of the match to again tip over a header from Cambridge’s Greg Taylor. With their first shot of the game just before half-time, Dominic Poleon went on a pacey run and blasted narrowly wide. Midway throught the second half Cambridge had a double-chance when Glenn Morris saved Ade Azeez’s cross at near post before O’Neil stabbed attempt is stopped by Morris’s foot. David Forde made a good one at his near post to deny Ollie Palmer whose powerful shot rolled to the feet of substitute Panutche Camara but he could not keep the ball in play. Gambin have Crawley the lead in the 71st minute with some quick feet out-witting the Cambridge defence and shooting to the left of the ‘keeper from just inside the area. Palmer then added a second goal just six minutes later when he chested the ball down, beat two defenders and comfortably shot past the ‘keeper to secure Reds’ fourth successive home win.